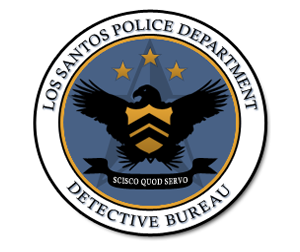 The Detective Bureau is one of the LSPD's divisions, their main objective is to help uncover the hidden illegal items of the gangs within the city of Los Santos. They're like any officers within the department they perform normal patrols, attend meetings and trainings but they're oftenly undercover among the gangbangers trying to reveal information. Case #001 - Grove Street Families. 29th of September - 02:00 AM. Officer Lawrence Jackson went for his locker inside the police station as he changed his clothes into ghetto stylish clothes and then went for Ganton area. He hid his vehicle in an alleyway as he then completed the rest of his destination on foot, as soon as he entered the street, he spotted an individual that goes by the name 'Big Bear'. Few minutes later while Jackson was trying to win Bear's trust, Bear showed Jackson a dead body hidden somewhere next to a garbage container, after that Big Bear had to head for his "crib" and mentioned "marijuana". As soon as Big Bear left the area, Jackson managed to take few screenshots for the dead corpse and record the conversation with Big Bear. The investigation is still on going. (( OOC: The topic is still under construction and these are just few screenshots I took while RPing with [GSF]Beatz, any MG or such will have their own punishments and consequences. Location : IRL: Egypt. IG: Willowfield factory/warehouse.